Frosted glass window provides an elegant touch. Faux leather surface not only keeps your monitor in place without scratching, but also provides luxury. 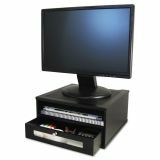 Victor Midnight Black Monitor Riser, Wood, 13 x 13 x 6 1/2 - Ideal for home or the office, this monitor riser is part of the Victor Midnight Black Collection that combines functional solutions with appealing design elements. The monitor riser provides an open shelf for papers, reports and books. 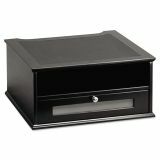 The large drawer can be placed in either of the two locations, providing flexible storage for desk accessories. Rear access space helps manage cables and allows flush positioning against the wall. 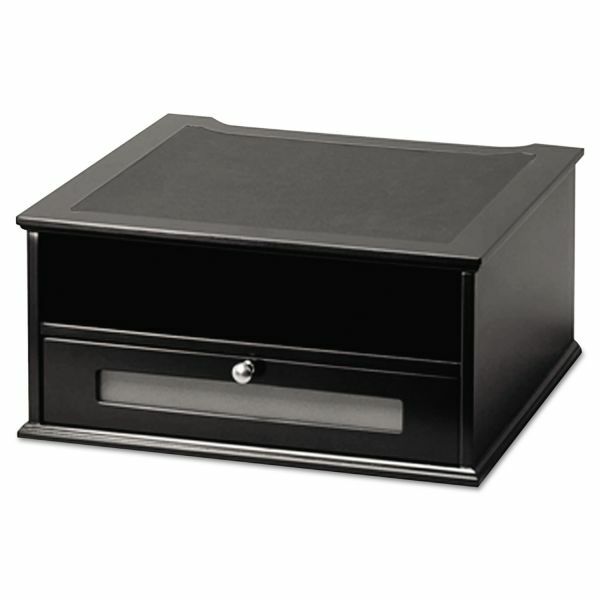 Sturdy, wood construction has a durable, double-coated, matte black finish. Brushed metal handle, faux-leather top and a frosted glass window add a touch of class. Nonslip rubber feet reduce movement and protect your worksurface from scratches and scuffs. 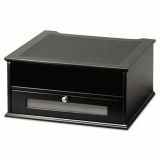 Large design holds your monitor while providing storage for papers, notebooks and supplies. Open shelf is large enough for folders, not just papers. Large drawer on the bottom is a perfect spot for office accessories. Hand-finished matte black surface offers a clean and modern look.